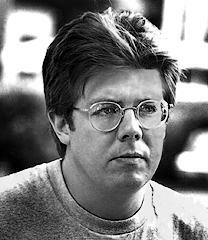 AKA John Wilden Hughes, Jr.
John Hughes wrote for National Lampoon in the 1970s and became an editor at the magazine in 1979. He was an uncredited "re-writer" for several extremely awful movies, before deciding he could do better. His first produced screenplay was National Lampoon's Class Reunion in 1982. He then wrote Mr. Mom and the first Griswold family road trip, National Lampoon's Summer Vacation, and created the "high school" films that made him a household name, including The Breakfast Club, Sixteen Candles, Pretty in Pink, Some Kind of Wonderful, and Ferris Bueller's Day Off. The Breakfast Club and the high school scenes for Ferris Bueller's Day Off were filmed at Hughes's alma mater, Glenbrook North High School, in Northbrook, Illinois. His funny but sometimes insightful view of white suburban teen life established Hughes as the king of '80s acne cinema. By then, though, Hughes was 36 years old, and perhaps he was tired of being identified as a moviemaker for teens. His next film, the underrated and enjoyable Planes, Trains, and Automobiles with John Candy and Steve Martin, had protagonists who were about Hughes's age. It was also the last movie he directed that connected with a wide audience. The last film he directed was Curly Sue in 1991, and his last directoral effort that was even nominally worth watching was Uncle Buck in 1989. As a writer, Hughes' works include National Lampoon's Christmas Vacation and his biggest hit, by far, 1990's Home Alone. Directed by Chris Columbus, Home Alone earned more than half a billion dollars, remained number one at the box office for twelve consecutive weeks, and spawned three increasingly wretched sequels. After Home Alone, though, almost everything Hughes wrote was a critical and box office failure, including the remakes of Miracle on 34th Street, Flubber, and 101 Dalmatians. He left Hollywood in the mid-1990s, and faded into obscure retirement until his death in 2009.